1. Heat oil in a pan. Add mustard, when it splutters add cloves and cinnamon. Add chopped green chillies saute. Add garlic and onions fry them till light brown. 2. Now add green peas and salt. Cover the lid cook for 10 minutes in medium heat. 3. Add tomatoes, chilli powder, coriander powder, turmeric powder, cumin powder. Cook for another 10 minutes in low to medium heat. 4. 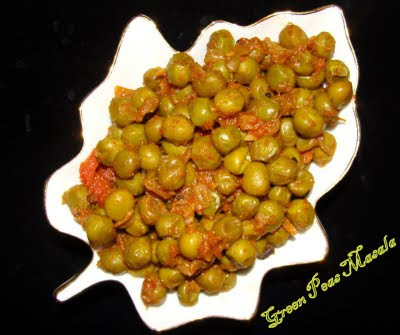 Green peas masala is ready to serve and it goes well with chapati, rotti and rice.